Summary: These were not the bumper results I had become accustomed to from MTVW. The residential-property trader owned up to lower earnings due to rising stamp duty, although the all-important net asset value did march higher as debt was reduced to a new low. My latest sums point to a possible net asset value of £200 per share based on the firm’s previous mark-ups on sold properties. I continue to hold. I must confess that I did not expect MTVW to report revenue down 20% and operating profit down 16%. What is also odd is that revenue during the preceding second half was £37m — so not much greater than the £34m recorded during this first half. So if these transactions would normally have completed in this H1, last year’s H2 would instead have been somewhat subdued. 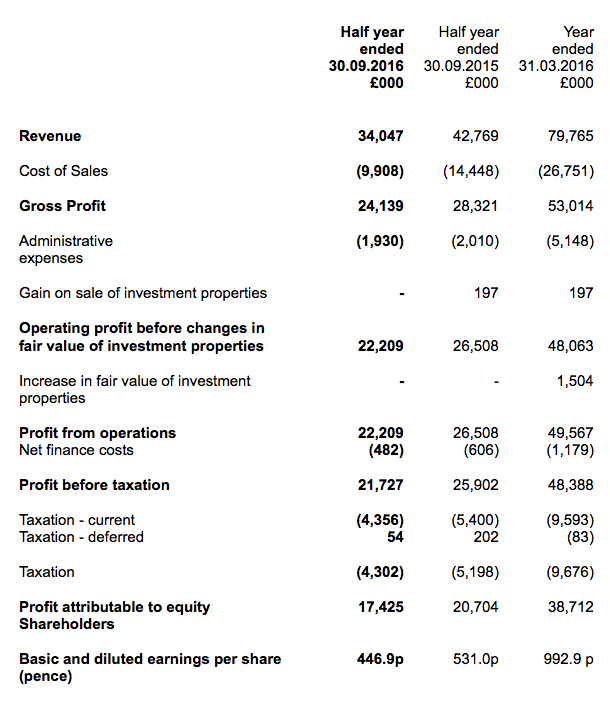 Anyway, what is now becoming clear is that last year’s £43m H1 revenue figure was a freak result. During other six-month periods since 2013, revenue has bobbed been between £30m and £37m. I should add that MTVW’s revenue is always dependent on the amount of property stock that becomes available for the group to sell. This amount is inherently difficult to predict, as availability mostly occurs on the death of the regulated tenant. MTVW’s gross margin was the highlight of this statement. I noted within the full-year results that the gross margin had hit a fresh high of 66.5%. Well, this statement indicated a gross margin of 71%. Clearly MTVW has been able to receive generous prices lately for its properties — which are carried in the books at net cost and are generally held for a decade or two before being sold. (Either that, or MTVW has simply been selling property at ordinary prices — and the properties sold were in the books for peanuts because they were bought several decades ago. (MTVW has been operating since the 1930s)). Anyway, a 71% gross margin means MTVW has been selling properties for a 245% gain. For some perspective, the group has enjoyed an average 166% gain on sold properties during the prior ten years. Although MTVW’s H1 profit was not the highest the firm has ever recorded, it did add £13m to the balance sheet to help take net asset value (NAV) to a fresh £325m/£83 per share peak. Something worth noting is this H1 saw MTVW’s total borrowings decrease by £6m to £37m — to stand at their lowest level since 2007. Looking back, that was a good time for property companies to be light on debt. Maybe MTVW’s veteran chief exec — who has been in charge since 1990 — senses now may not be the best time to be going all out buying regulated-tenancy houses. The chief exec described MTVW’s gearing as “comfortably modest”, and I calculate total debt represents just 11% of the book value of the firm’s trading properties. My records indicate this ‘gearing’ percentage is the lowest for at least 20 years. Taxing the resultant gain at 20%, adding on other investments of £30m, and then subtracting net debt of £36m and other liabilities of £2m, I arrive at a possible NAV of £780m or £200 a share. That £200 compares to the latest £83 per share NAV reported by MTVW on a historical-cost basis. With the share price at £108, clearly there remains some upside potential here. But as always, the great unknown is how long it will take MTVW to sell all of its properties to realise that potential £200 per share NAV guess. For a more immediate valuation, there is the £666m figure assigned to MTVW’s trading stock as at September 2014 by an independent assessment. Adjusting this £666m valuation for tax, investment properties and debt, I come to an NAV of £151 a share. This £151 estimate is based on MTVW’s properties being valued in their current ‘regulated tenancy’ state — so does not include any upside potential for when the property is vacated and can be sold at market value. Note that this £151 estimate does not include any house-price gains experienced since the September 2014 assessment, and does not adjust for properties bought or sold thereafter. Meanwhile, the trailing 300p per share dividend provides a yield of 2.8% at £108. Disclosure: Maynard owns shares in Mountview Estates. Talisman Dynamic Master Fund Ltd has taken its stake from just below 3% to 4.14% — and has become the only non-Sinclair family disclosable holding. The Telegraph article suggests the Pears family is another that owns another low-profile property empire — albeit somewhat larger than MTVW. FWIW I think the Pears family will be the ones to buy out DM SInclair and the rest of his family at some point. I also Own MTVW. It’s a great store of value but has been becalmed of late. Still, it pays a decent dividend. Thanks VegPatch. I like your write-ups on Stockopedia, too.